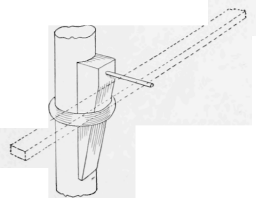 An adjusting device for a vaulting pole that can be easily fixed at any point on a round pole by using a wedge and ring, is shown in the sketch. The wedge carries a pin on which to place the cross pole. The manner of using this device as well as its construction is clearly indicated. - Contributed by Sterling R. Speirs, St. Louis, Mo.